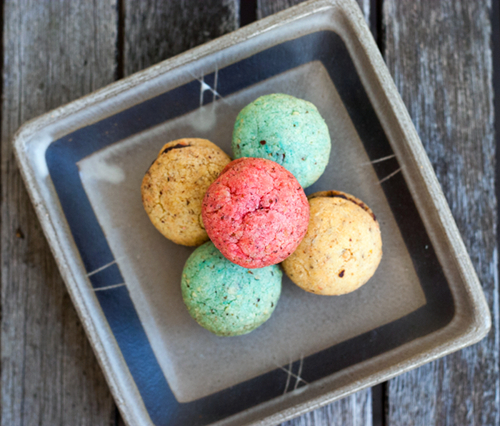 Colorful and fruity version of Italian hazelnut cookies (Baci Di Dama). Preheat the oven to 350 degrees F. Line 2 or 3 baking sheets with parchment paper. Grind nuts and sugar in a food processor until powdery. Beat together butter, zest, salt, blueberry flavoring, food coloring, and nut powder in a large mixing bowl with rubber spatula until creamy. Add flour and keep mixing until well incorporated and forms a dough. Roll about 1/2 teaspoon of the dough into tiny balls and arrange 1-inch apart on the baking sheets. Bake in the oven for 12-14 minutes or until they turn light brown. Transfer to wire rack and let them sit to cool completely. Place the fresh blueberries in a medium saucepan. Cook over medium heat , stirring occasionally, until the thick sauce forms and reduced to about 1/4 cup. Remove from the stove and set aside. In a double boiler, melt the chocolate, then add blueberry sauce and heavy cream. Stir until the ganache is smooth. Transfer ganache to a piping bag, snip off the bottom of the piping bag to form a small hole. Pipe small mound of ganache onto the flat side of a cookie and top with other cookie, pressing 2 cookies together to help adhere. Repeat with the remaining cookies. These are beautiful!!! And I'm in love with the idea of blueberry ganache! What fun! I love the red, white (well, as white as they can get) and blue. Going to save these for 4th of July! these look so fun and sound so delicious! love that blueberry ganache! When we lived in Albany, NY we had never really seen an Italian bakery. There was one there that my Irish Father in Law was in love with. Every time they would visit, we would get a big box of all sorts of their Italian cookies. Yours looks delicious! These look so interesting, I also love the idea of blueberry ganache. I bet it tastes heavenly with hazelnuts! Blueberry ganache is (IMO) ten times better than regular ganache. It's sweet, fruity, and slightly tangy. These look stunning and I love little hazelnut cookies! This recipe looks absolutely amazing. All I read was "hazelnut...ganache" and I was sold. You know what's awesome about these? 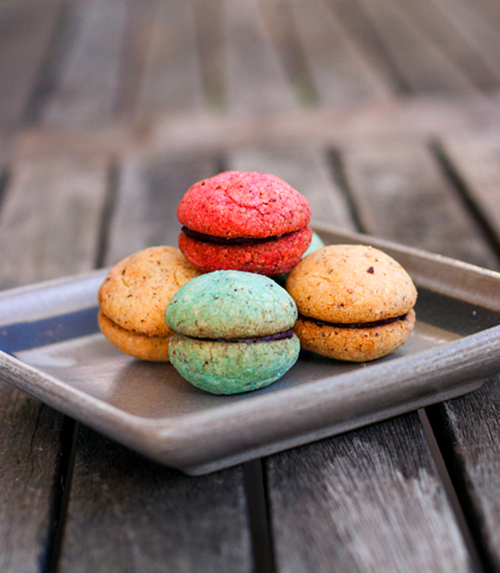 From a distance they look just like pretty little macarons...but WAY easier. Whoa. I'm sold. Now that you mentioned it, they look like macarons LOL. Aren't they pretty? hi these look delicious!! im thinking of making them in a few days. i was just wondering what the total amount of time is needed to make these cookies since i am restricted to a 60min time limit. Thx! !